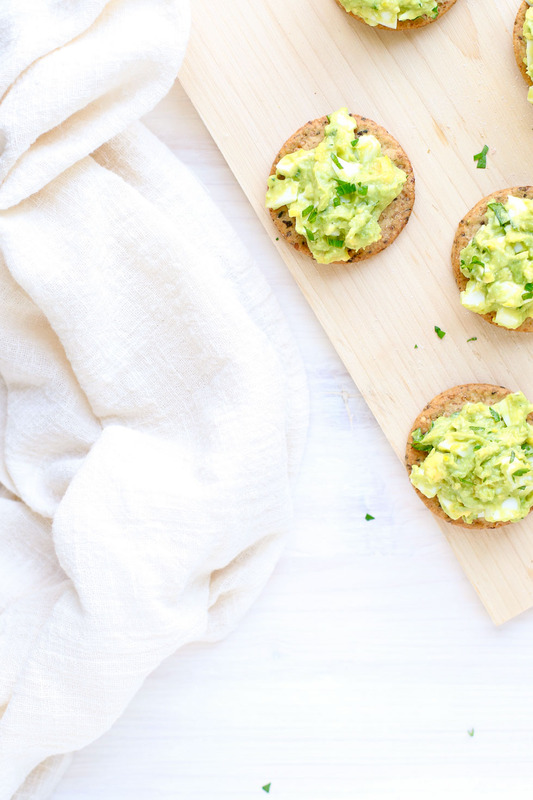 This easy herbed avocado egg salad is served on sprouted seed crackers for a bright but hearty appetizer for your next brunch, party, or shower. This post is sponsored by Simple Mills. By now you would have tossed all of the leftover eggs from Easter – if not, please do. 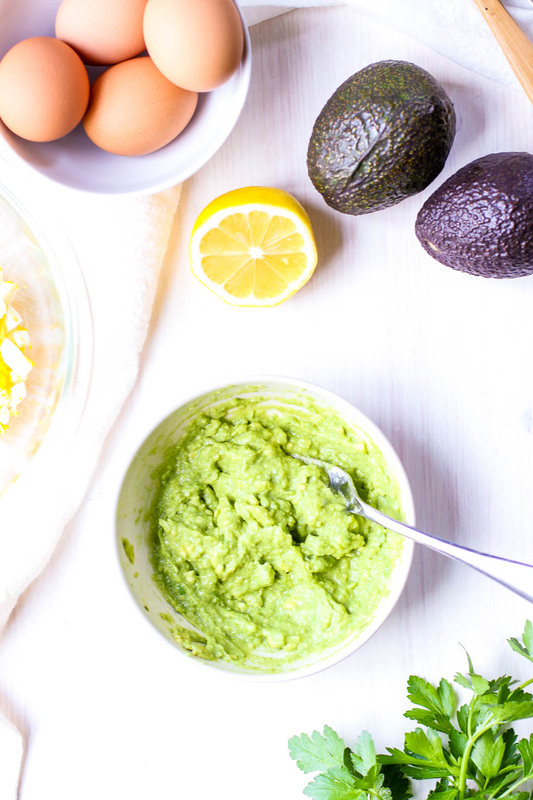 But if you have eggs in the fridge, this Herbed Avocado Egg Salad is begging to be made! With brunches, bridal showers, and graduation parties gearing up and Mother’s Day right around the corner, you might be looking for new appetizers to serve. 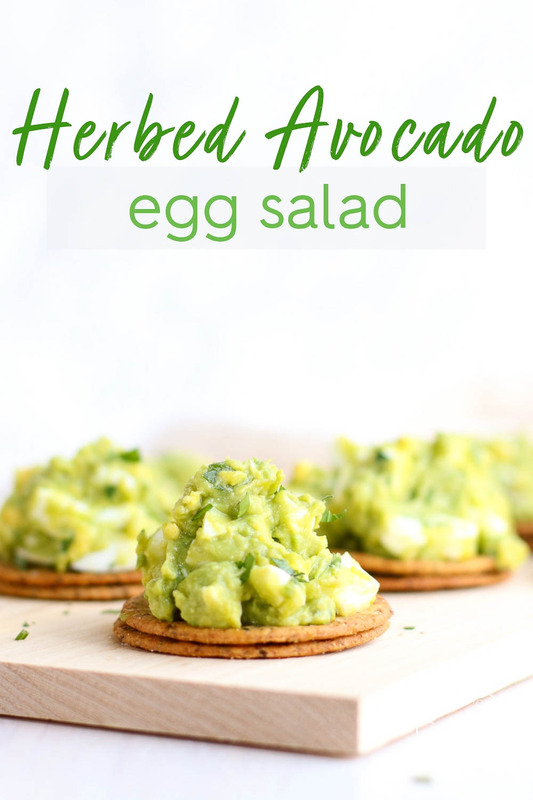 Whether you’re planning a patio party or just want a snack for lunch on a warm day, this Herbed Avocado Egg Salad is a tasty way to elevate plain boiled eggs – even it is only for this week’s meal prep. 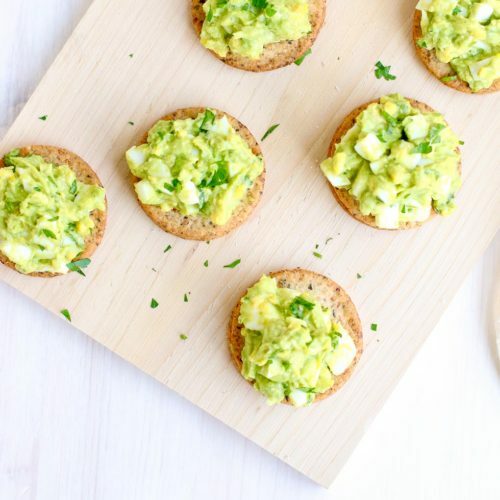 This twist on traditional egg salad is enlivened with luscious avocado, fresh lemon juice, and herbs, then served up on a stack of Simple Mills Sprouted Seed Garlic and Herb Crackers. The crackers add incredible crunch to each bite. The avocado adds a decadent creaminess that perfectly complements the protein-rich eggs while the lemon juice adds zesty flavor to bring it all together. Whether you have parsley, chives, or dill on hand, fresh herbs add a bright finish that goes well with the citrus flavor. This appetizer comes together quickly and can easily be doubled or tripled. 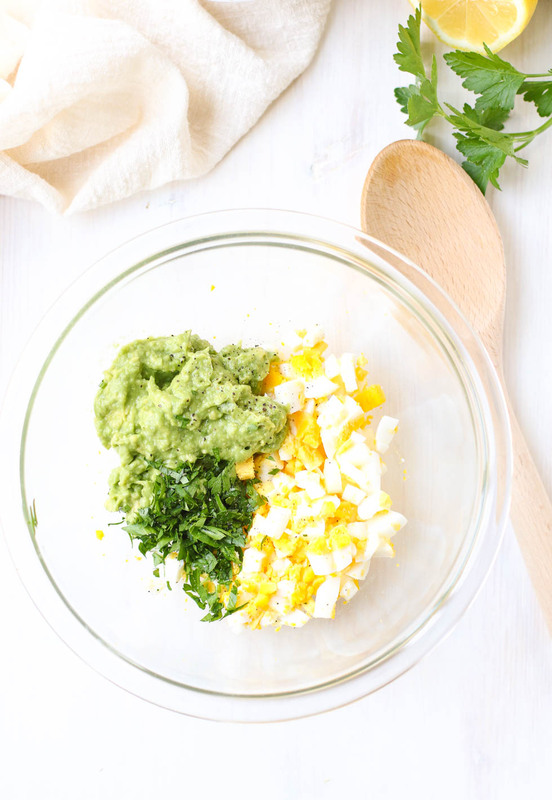 Simply boil and chop a few eggs, slice, peel and mash the avocado, mix with lemon, herbs, and seasonings and you’re done! You can even boil the eggs a couple days ahead if you know things will be busy the day of the party. The crackers more than hold up to this avocado egg salad but I love stacking them for double the crunch. It also gives guests the option to flip the bottom cracker to make a little sandwich. If you happen to be the lucky host, boil a couple extra eggs for any leftover avocado. Believe me, you’ll want to snack on this the next day. Have you seen Simple Mills’ Sprouted Seed Crackers in stores? If not, visit your nearest Sprouts store for the entire collection. I used the Garlic and Herb flavor here but this recipe would work well with the “Original” and “Everything” flavors too. Now, here’s the easy recipe! Making the salad: Slice and pit the avocado. Scoop the flesh into a small bowl. Lightly mash the avocado and stir in the lemon juice, olive oil, salt, and pepper. Add the chopped eggs and toss lightly to combine. Assembly: Place the sprouted seed crackers in stacks of two on a serving platter. Add a dollop of avocado egg salad to each stack. Top with fresh chopped parsley, chives, or dill. Serve immediately. Wow, Marisa! You have got some bright and colorful creamy deliciousness here! 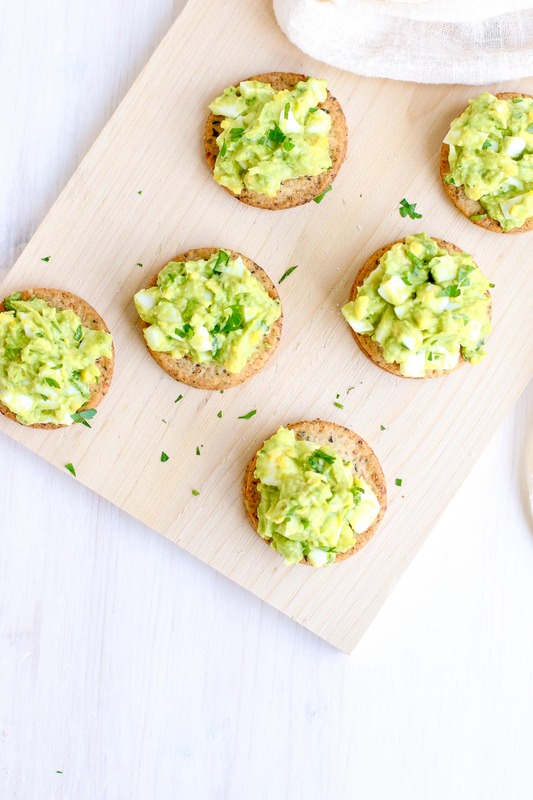 I am a huge fan of avocados, eggs AND simple mills crackers! 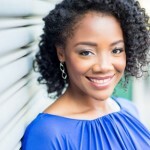 This is a WIN for me! I love mixing avocado with egg for a sandwich filling. But I like that you put it in crackers - would be good for a party. I love avocado egg salad! :) It's such a great and lighten up version of the classic egg salad. Yum.